The existence of the following colors has not yet been proven to exist in the Chincoteague. If you have photographic evidence of Chincoteagues in these colors in the present or in the past please contact The Colorful Chincoteague! Appaloosa is famously known by its spots and many varied expressions of those spots. Appaloosa is not the result of just one gene, but of a group. The Leopard Complex (LP) is what creates the ability for appaloosa to exist. Pattern genes change the leopard complex into the many other versions of appaloosa. Varnish roan is the leopard complex without any other patterning mutations. Pattern 1 (PATN1) is what creates the well known leopard appaloosa patterns. Appaloosa is an incomplete dominant, it cannot skip generation and a homozygous appaloosa will have more white than a heterozygous. Horses that are homozygous for LP have Congenital Stationary Night-blindness (CSNB). Understanding how the appaloosa pattern works is a complicated mix and is still being researched. The Appaloosa Project is leading the research into understanding appaloosa. There is a test available for the leopard complex. A photo of an appaloosa Mustang mare and foal from the 1984 Pony Penning has been found. This is the only known example and they did not breed on and as such never truly existed in Chincoteagues. They were part of a group of Mustangs introduced that year most of which did not survive the winter and was also likely their fate. Brindle causes dark or white striping on a pony's body and is similar in appearance to what is found in cattle and dogs. In horses a true breeding brindle color has not been found. Some brindles are a result of chimerism, which is when fraternal twins fuse in utero resulting in one horse with two sets of DNA. Another form of brindle is heritable, but is a symptom of the genetic disease Incontinentia Pigmenti (IP). IP is dominant and results in partial hairlessness with abnormalities of the teeth, hooves, and eyes. IP is also only found in females as the males die in utero. Striping effects can also be found due to grey, dun, and roaning that can resemble brindle. Champagne (CH) is a dilution that lightens the body and the points. Champagne is dominant, meaning it cannot skip generations. A distinctive trait of champagnes is a metallic sheen to their coats. Champagnes are born with pink skin that darkens with mottling. They are born with blue eyes that darken to hazel. Champagnes often go through seasonal coat changes and as they age. Gold champagnes are chestnut with champagne, they are sometimes mistaken for palominos. Amber champagnes are bay champagnes, and are sometimes mistaken for buckskins. Classic champagne is black with champagne, and are a mousey brown color. Sable champagne is seal brown/dark bay with champagne. Champagne has only been found in American breeds such as Tennessee Walking Horses, Mountain Horses, Missouri Foxtrotters, Miniatures, American Cream Drafts, etc. There is a test available for champagne. Dun (D) is a dilution that lightens the body while leaving the points fairly close to the base color. Dun is characterized by a distinctive dorsal stripe and leg barring. Duns can also have shoulder stripes or cobwebbing/spiderwebbing. Dun is dominant, meaning it cannot skip generations. Chestnut duns are generally called red duns, bay duns are sometimes called yellow duns, and black duns are often called grulla or grullo. There is a test available for dun. Dun has not been found in Chincoteagues; past or present. Buckskin and dun are sometimes used interchangeably or mistaken for one another, this is incorrect as they are two different colors genetically. Horses with primitive markings but are not diluted are called Primitives or countershading, but are not dun. This testable mutation called non-dun1. 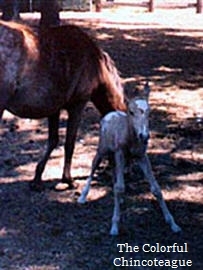 Foals are also often born with dorsal stripes that disappear when the foal coat is shed and is presumably a type of camouflage. Dun may have existed early in the breed as there are a few accounts describing ponies as dun. However, dun is traditionally used to describe buckskins and the term is still used today in parts of Europe so the described ponies were likely the modern descriptions of buckskin not dun. A 1891 article in the New York City newspaper The Sun stated that the ponies "are most frequently black, gray, sorrel, or dun." Additionally the 1910 Pittsburgh Times stated that "White and dun-colored ponies are exceedingly rare." A 1923 St. Petersburg Times article described the ponies as "bay, gray, dun, black, and sorrel". Conversely Leonard D. Sale wrote in 1896 in The Horse Review of Chicago that, "I have never yet seen a grey, piebald, dun, or yellow purely bred island pony." Pearl (prl), also known as apricot or the Barlink Factor, is a dilution that dilutes both red and black/bay based horses. Pearl is recessive thus only a homozygous pearl has a diluted coat. The skin of a homozygous pearl is pale with dark tan eyes. One copy of pearl has no effect and as such it can skip generations. When one copy of pearl is combined with cream pseudo double dilutes are created that have pale skin with blue or green eyes. Pearl has been found in Andalusians, Lusitanos, Peruvian Pasos, Quarter Horses, Paint Horses, and Gypsy Horses. There is a test available for pearl. Rabicano (RB), also known as rabicano roan or white ticking, is a scattering of white hairs. The hairs are on the flank and can extend over the body. Rabicanos almost always have a white tailhead known as a skunk tail. White striping over the ribs is often seen. Rabicanos can be very minimally expressed or so extensive it could be mistaken for a classic roan. Rabicano is often seen in Arabians and Quarter Horses.